Iron is one of the most important minerals required during pregnancy. The requirements of iron increase by 14mg/day which can be attributed to achieve adequate iron to transfer to the growing fetus, increase in maternal blood volume and loss of iron through skin and sweat. Iron requirement increases in the second and third trimester. Iron should be consumed in large doses initially also to build up iron stores and protect the depletion of existing stores and prevent iron deficiency anemia in both the mother and fetus. 2. Turmeric Powder (Haldi) : Warm Honey Lemon Water with Turmeric is a simple detox solution that can be consumed everyday, first thing in the morning. 3. Cauliflower Greens : Cauliflower leaves are nothing but the green leaves that cover the cauliflower and often are sold along with the entire cauliflower. So have no fear and explore all these sources of iron and make up for your heomoglobin throughout the 9 months of gestation. When we think of iron we first turn towards green leafy vegetables. In this section, we'll find a wide variety of greens right from common ones like fenugreek, spinach to a few uncommon ones like colocassia leaves and chawli leaves. Chawli Masoor Dal is a recipe which combines the goodness of chawli leaves and masoor dal and is loaded with iron. The vitamin A together with the protein in the dal helps to maintain healthy skin and vision, while the iron keeps anemia at bay. Colocassia Leaves Usli is a unique dry sabzi loaded with protein, fibre, vitamin A, phosphorus and iron. Cauliflower Greens, Methi and Palak Healthy Subzi, Palak Methi and Corn Subzi, Sai Bhaji are a few recipes added to this section after a thorough research, especially for mums-to-be. To your surprise, legumes and pulses are also a fair source of iron. We have explored these beans in various recipes. Sprouted Matki Poha is a protein packed snack loaded with iron and gives about 22% of your daily requirement of iron during pregnancy. Keep this jar snack Methi Crispies handy whenever you feel hunger pangs in the evening. The curd added in it not only improves its texture but also adds taste and mask the bitterness of fenugreek. Enjoy it with your favourite healthy dip. This Spinach Dosa is made healthy by using wheat flour instead of rice. Spinach also is a good contributor of the antioxidant beta-carotene in this recipe. 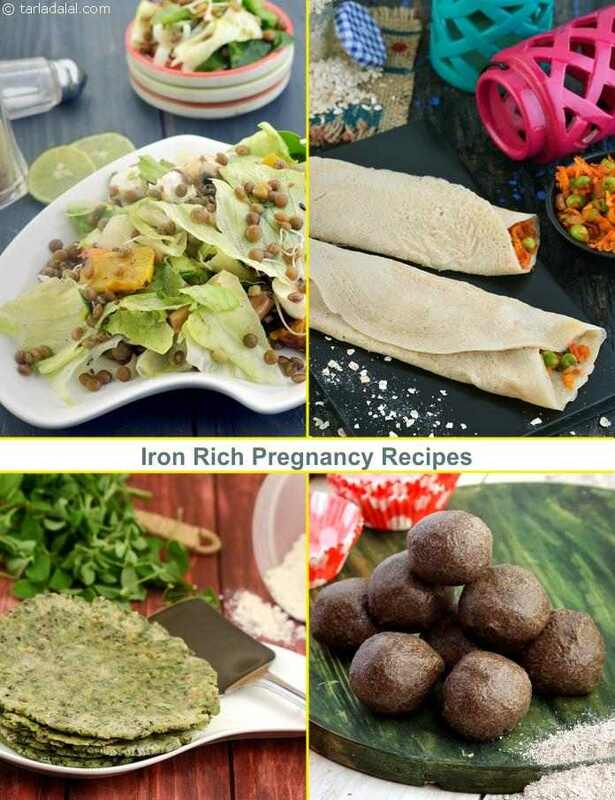 Enjoy all our iron rich foods for pregnancy and also try our other iron rich recipe categories from the options given below.